WEST AFRICA - Whilst outbreaks of H5N8 highly pathogenic avian influenza have been spreading through Europe, India and the Middle East in the past few weeks, West Africa has been struggling with the disease for a long time. The H5N1 type of avian flu has been infecting premises in West Africa since 2015. The latest outbreaks to be reported were in Ghana and Nigeria. In Ghana, two outbreaks in the souther Greater Accra region affected layers in deep litter. Over 800 birds died and another 688 were destroyed to prevent the disease spreading further. 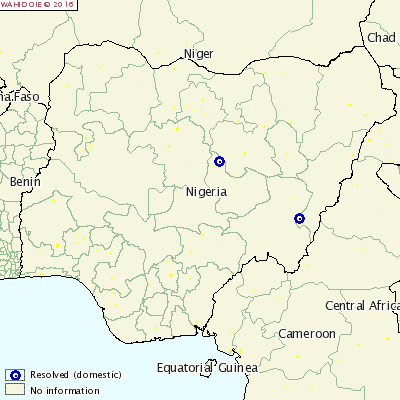 Meanwhile, Nigeria has reported two outbreaks of avian flu in the Bauchi and Kano regions (pictured below). The outbreak in Bauchi was on a farm, whilst in Kano it affected a backyard holding with chickens, geese and guinea fowl. Over 300 birds died and 638 were destroyed in the two outbreaks. Both countries are using movement controls, quarantine and surveillance measures to further prevent disease spread.